In human terms, this technique is called eugenics. Keeping the traits you want and killing off the rest. A practice the Nazi party promoted in World War Two for the perpetuation of a ‘pure’ Aryan race, free from any ‘racial impurities’. A movement which already existed in the USA under the auspices of the American Eugenics Society during the 1920’s and 30’s. 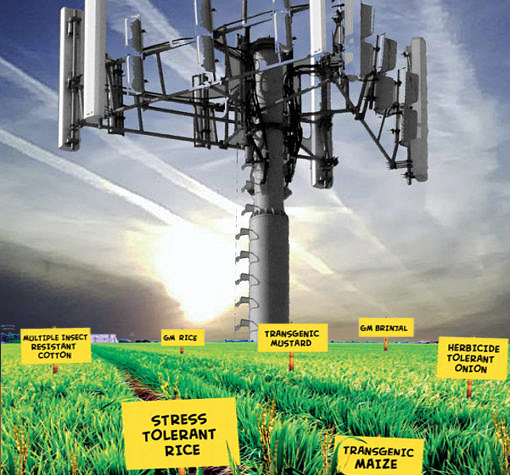 WiFi and electromagnetic microwaves were developed as secretive weapons of war in the 1950’s. ‘Silent weapons for quiet wars’ as their promoters described them, in the course of US military defense programs secretively rolled-out during the cold war period of stand-off between Russia and the USA. We need to recognize that inhuman minds are behind inhuman technologies. Just think of the tens of thousands who have suffered a cruel fate under the commercial villainy of Monsanto over the past decades. With its asbestos, agent orange and aspartame – well before toxic GM soya beans ever saw the light of day. Its marriage to ex-Nazi Bayer corporation, reveals common fascistic ideologies. These same ideologies fuel the ambitions of politicians, media tycoons, bankers, corporate executives, technocrats and military hegemonists who rule the world today. This entry was posted on 2 March, 2019 in homepage. Bookmark the permalink. There is a certain way to stop all this. Quit buying the services. If we do not use them, they will go away.